I've had a few emails asking how I cure my olives. So here is my easy method. Poke each olives with a metal skewer a couple of times. This helps release the bitter juices. Place olives in container, toss in a handful of rock salt and cover with water. Place a plate on top to hold olives under water. The amount of salt will depend on the amount of olives and the size of your hand. I average about a cup of salt to 5 litres of water. Change water daily and rinse olives returning to a fresh salt and water bath. Start tasting olives after about two weeks to check on bitterness. 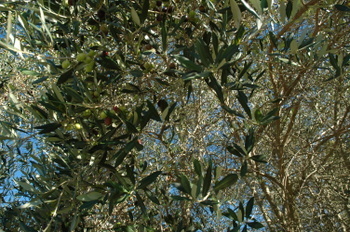 When you are happy with the taste of the olives drain the salt water, rinse, shaking of excess water. Place olives in a clean and sterilised jar. Tuck in some sprigs of rosemary and lemon peel and cover with olive oil. Store in a cool dark cupboard until ready to use. These are great eaten on the own with a nice glass of wine or added to casseroles. This cute little angel has been made with beads sent to me by Judy in Adelaide. Thanks Jude. I hope you all have a Happy Easter and enjoy lots of feasting over the holidays. And may all your Easter egg hunts be successful. Restaurant Magazine have released the list of what they consider to be the the world's top restaurants. Read the Sydney Morning Herald article here. I'm happy to say my beloved Tetsuya's came in fifth. The April issue has some terrific recipes so check them out while you are there.